The anti-condensation heater should always be mounted with the cooling ribs in vertical position. The best circulation is achieved by placing the heating element at the lower part of the cabinet. Due to the element’s low surface temperature, the position in relation to other components in the cabinet is not critical. Although it is recommended to maintain 5 cm free space on the sides and approx. 3 cm free space to the bottom due to air circulation. The cooling fin profile has an optimal surface in relation to heat loss in circulating airflow. The element is made of black anodized aluminium which optimises heat conduction and emission. 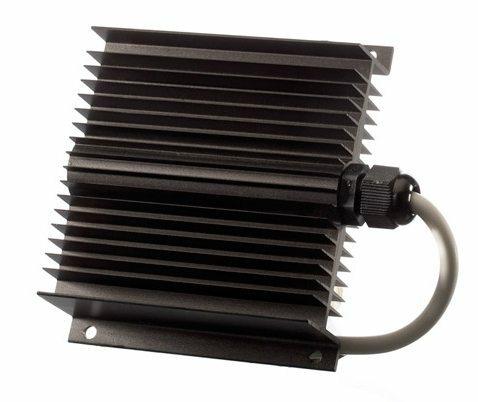 The anti-condensation heater is supplied with temperature limit or as a selflimiting construction where a PTC element supplies the profiles with power according to the surrounding temperature.